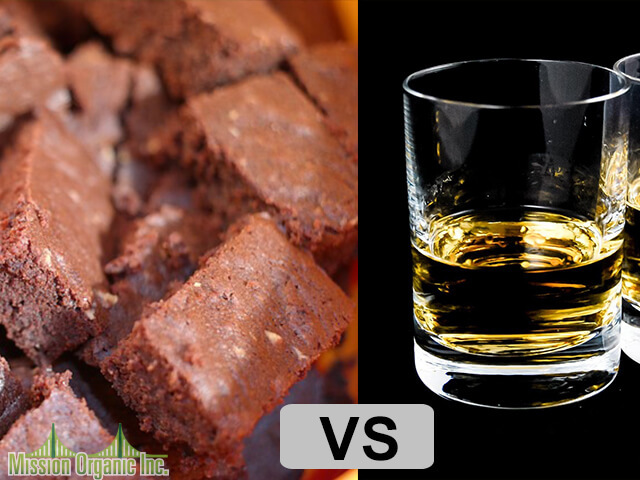 Which do you think is better for consumption: edibles or alcohol? The edibles vs. alcohol debate have been raging for some time, and it’s becoming more popular than ever. Giving a straightforward answer to the question can be a little hard as you need to analyze several factors to arrive at a reasonable conclusion. For example, both substances affect the brain and can produce a high feeling in those who consume them. But one of the key differences is that while the negative effects of alcohol have been long-researched and proven over time, marijuana-infused edibles do not have any well-established adverse effects. So between edibles and alcohol, which do you think is worse? Let’s get into this question by comparing the two substances. Death: Drinking alcohol excessively has a wide range of numerous risks, and one of the most common risks is a shorter life expectancy and nerve damage. In fact, alcohol can kill you in minutes if you engage in binge-drinking because of the insufficient time available for your body to metabolize alcohol. The excess consumption will lead to a build-up which can affect your brain as it will shut down the areas necessary for survival like the areas associated with your heartbeat and respiration. In contrast, an overdose of edibles has not been reported to sudden death. The effects from an overdose of edibles usually do not take place immediately since it takes some time for the body to absorb the substances. The estimated average time for the effects of consumed edibles to kick is 2 hours. However, when the effects do kick in, they tend to make the person lose touch with reality and take reckless actions and probably harm themselves. The most common effect is paranoia which can be quite intense, but that is the peak of effects you can have from overdosing on edibles, and it has no connection with death. To place these two substances side by side, while alcohol is reported to cause 88,000 deaths per year, there are no reported deaths from edibles consumption. Cancer: One of the long-term health consequences of drinking alcohol too much is that it may lead to liver damage in which scar tissue replaces healthy tissue. This condition is called liver fibrosis, and it can cause the liver to malfunction. Left unchecked, the condition can degenerate and lead to liver cancer which is also known as hepatic cancer. In fact, according to the National Cancer Institute, there’s a strong correlation between alcohol and head, neck and breast cancers. Conversely, no established research suggests that edibles can cause cancer. Instead, marijuana edibles offer a discreet way to medicate without inhaling smoke. Some studies indicate that marijuana can aid treat symptoms of cancer by alleviating the acute pain patients feel, stimulate their appetite and help reduce nausea and vomiting. In essence, marijuana-infused edibles do not cause cancer; instead, they can help patients with cancer battle the symptoms. Impaired coordination: Like alcohol, edibles also have the ability to intoxicate, especially when it is consumed above the appropriate dosage. In such situations, alcohol and edibles share the same effects as they can impair coordination and balance, thereby increasing the risk of hurting one’s self. For this reason, people who feel intoxicated after drinking too much or who have consumed more than they can handle are advised to avoid driving as it’s unlikely that they can be coordinated until they become sober. Benefits: Is there any benefit to alcohol? This is a tricky question as it depends on how you drink. If excessively consumed, there are no health benefits; instead, you risk a range of serious health complications like high blood pressure, liver disease, stroke and certain kind of cancers. The reverse is the case if you’re a moderate drinker as there are some benefits such as low rate of cardiovascular disease, lower risk of ischemic stroke and lower risk of diabetes. As for edibles, there a plethora of benefits you stand to gain when you consume them medicinally. For example, edibles can provide relief from pain which can last as long as 4-6 hours. And when consumed, they can help reduce nausea and increase appetite. Edibles have been clinically proven to help treat people with anxiety disorders as well as other anxiety-related pathologies. One of the recent practices associated with taking edibles is combining them with alcohol. Although the body of research into this trend is not well developed, there are a few propositions on why you shouldn’t combine them. Firstly, the body has a preference for metabolizing alcohol even if it was taken at the same time with other substances. In situations where alcohol was consumed in excess alongside edibles, the body will continue to metabolize the levels of alcohol while the effects of the edibles continue to accrue which can create a new and extremely intense high. The combination could bring about a strong level of effects which might be a little harder for even experienced recreational users to manage. Secondly, by combining edibles and alcohol, there’s a good chance you may overdose on either substance. Edibles are known to have antiemetic properties which help to reduce nausea and vomiting in its consumers. This is a sharp contrast to alcohol where people who drink moderately tend to get rid of the excess alcohol from their system by vomiting. This could lead to a serious medical situation as the edibles act to suppress vomiting while the body tries to expel the excess alcohol it cannot metabolize. Additionally, combining alcohol and edibles may lead to long-term effects associated with drug abuse of any type such as increased risk of liver disease, cardiovascular issues, kidney disease, gastrointestinal issues, decreased functioning of the immune system and certain types of cancer. Furthermore, there’s the possibility that the combination could lead to death, especially in cases where there’s an excess intake of alcohol. The reason is that while the body wants to rid itself of the excess alcohol, one of the key effects of edibles is its help against vomiting. This might lead to a case where the individual chokes on the vomit that is produced and this can lead to death. While a lot of research has been conducted on the effects of alcohol, the body of research that investigates the consumption of edibles is not well developed. Nevertheless, going by the analysis of the two substances, it’s clear that alcohol is more dangerous than edibles. Studies have shown that edibles have a number of medical uses while alcohol has no known medical use except for a few benefits you may derive from it if you drink moderately. On that basis, edibles are less damaging than alcohol.